What girl doesn't love a great pair of boots? While I own quite a few pairs of ankle boots, one style that I don't have, is a flat, over the knee pair. 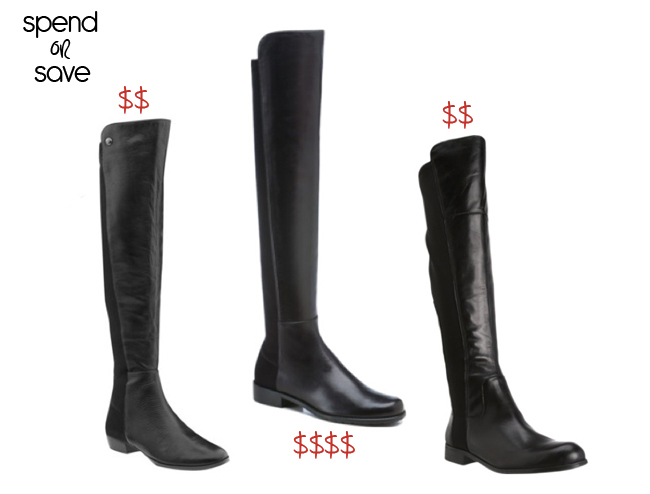 I absolutely love the "5050" boots by Stuart Weitzman, but I can't justify the $600 price tag. I did some searching and found a couple of pairs that are nearly identical and cost A LOT less. Honestly, I think I like the Franco Sarto pair much more than the pricey Stuart Weitzman's. So what do you think? Spend or save? LOVE the Franco Sarto's! I may have just found my otk boots! Thanks lady!